(1) ABC is an equilateral triangle. 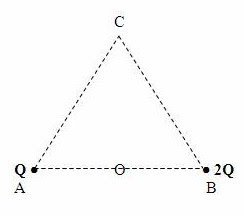 When positive charges Q and 2Q are placed at points A and B, the electric potential at the mid point (O) of AB is found to be 180 V. What is the electric potential at the vertex C of the triangle under this condition? 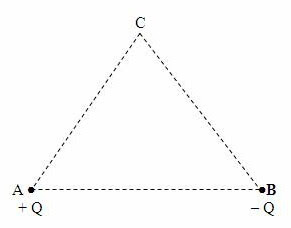 The distance of the vertex C of the triangle from the charges is twice the distance from the point O. Since the electric potential due to a point charge is inversely proportional to the distance, the potential at the vertex C must be half the value at C. So the answer is 90 V.
The force on the charge – q due to the charge + Q is attractive and is directed along CA. The force due to the charge – Q is repulsive and is directed along BC. Since these forces have the same magnitude, their resultant acts parallel to BA. The net force on the charge – q is thus directed leftwards [Option (b)]. Since the surface of the cube is an equipotential surface and there are no charges inside the cube, the electric field inside the cube must be zero. This means that the electric potential everywhere inside the cube is 2 V itself [Option (e)]. 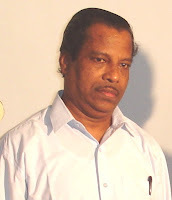 Since the field is due to negative charge, the direction of the field is towards the centre of the sphere.